When you can see a part of yourself or a loved one in a character of a book without any stretch of the imagination, you know the author knows how to write well. While of course not every facet of any character will apply to any one person, sometimes they just seem so real— a piece of somebody that calls out for a pause, one long enough to consider more deeply your own life or that of the person who seems to have fallen into the pages. Allison is so fully developed as a character that every move she makes and every thought she thinks feel human. To question her thought process (other than to ask why the hell didn’t she reach out for help) is to not get what it is like to be a mother under strenuous pressure. Most of us parents (? ), mothers, find more constructive outlets to vent our fears, frustrations, anger, and tears of futility. Most of us reach out. But some of us don’t, and thats when we get into trouble. That is when Alison gets into trouble. Several websites, including child welfare.gov, state that over 6 million children in the United States live with at least one substance abusing parent. A drug and alcohol treatment centre called Michael’s House, states that prescription painkillers, the villain of this particular story, fall behind only alcohol and marijuana in terms of popularity (if I can call it that). The story that Ms. Weiner weaves is an important one, and needs to be told. It can remind us all of the perils of trying to be the super-hero in every area of our over-complicated, post-modern, hyper-techno, status-driven lives. A somewhat uniquely beautiful thing about this book is how many of the characters are so well developed. Not only is Allison extensively drawn out, but Ellie (her daughter), Dave (her husband), her mother, and several of her friends are all given significant page space to grow and develop and be understood. Unfortunately, while there is stellar character development, some of the plot lines left me feeling like they were somewhat contrived, providing tension to the story where they were needed, but were subsequently dropped or hastily explained with no great intensity near the end of the book. All Fall Down would have been that much more powerful had a little bit more attention been given to the follow-up of those ultimately half forgotten pieces of Allison’s life. Every mother, every daughter, every father, aunt, uncle or friend should be made aware of the issues brought to light in this book. And if a mother ever comes to you overwhelmed or depressed, asking for help, listen hard and long before insisting that she is just being too hard on herself. I received this book from the publisher via Net Galley for review purposes. This entry was posted in Muse Reviews, What to Muse about life and tagged Addiction, Book Review, Family, Fiction, Parenting, Relationships, Stress, Trauma. Bookmark the permalink. I was wondering about this book; thanks for the review. I read DRUNK MOM and wanted to compare both of these books, but not sure how much I can handle. It’s pretty heavy on the emotions. Great review! 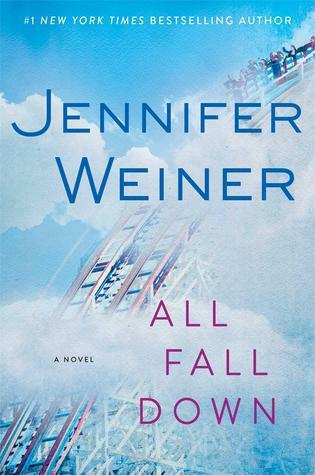 I’ve read several Jennifer Weiner novels, and liked them, but I think this one might be a little too heavy for me. I’ll keep it in mind, though.